You won't be successful as a trader until you're comfortable with the idea of being wrong. And that's part of why I'm successful. Part of the position was stopped out at -2.0 points; the rest was at -2.25 points. And I return and do it right. Because, you know what? One trade does not define the success or failure of my trading business. 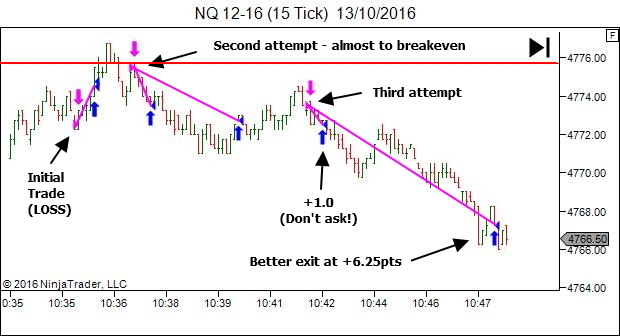 A trading edge plays out over a SERIES OF TRADES. It took me two more trades to get back in front. One that almost did it… it's just the commissions that kept me in slight drawdown. What was I saying before about "right but mismanaged"? Thankfully there was opportunity to re-enter! Yep… playing The Fourth Principle would have worked out so much better. But instead, I'm left with a whole lot of IMPERFECT DECISION MAKING!!! I'd love to show you only the "perfect" trade sequences. But that would be doing you a disservice. Reality is sometimes messy. You need to accept that. And you need to learn to profit DESPITE your imperfection. 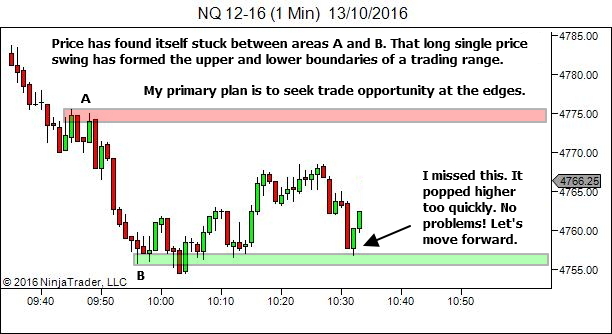 So if you find yourself overly frustrated after a trade loss, and unable to get back in while the premise is still valid, ask yourself why? Do you not believe in your edge? 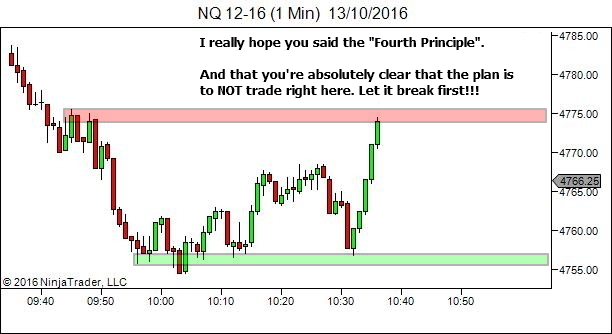 Do you not believe in your ability to trade your edge? 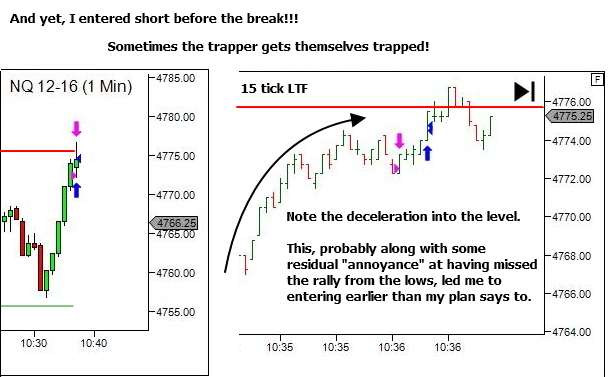 Are you trading too much size, such that a single loss actually HURTS? Or have you not yet truly understood and accepted the long-term nature of this business (aiming for positive results over a series of trades rather than on every single trade)? I know you like to override your definition of trend but on the first chart I am really lost. Why do you define A as a resistance level? I only can guess that you do not consider new SL after B as a significant one because of it’s fast rejection. Then A is last SH before SL. Can we include to A resistance all congestion from 4775 to 4768? And thank you very much for your article, very useful! I was a little torn as to whether or not to discuss the trend definition in the email. When unsure I always default to keeping the article simple, focusing only on the one main concept. I’m glad you asked about trend definition so we can discuss it here. Personally, I wouldn’t have any problem with someone who assessed this differently to how I did. 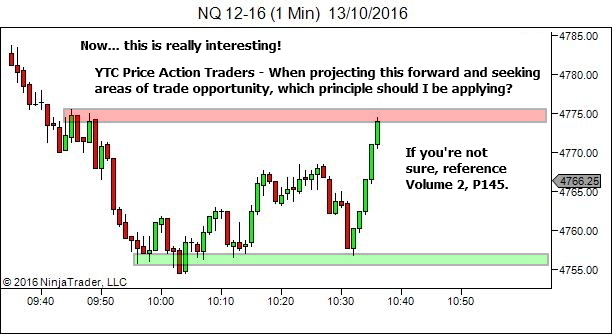 The rules, when applied objectively, do take into account the swing high at approximately 10:00 and the swing low at around 10:03. I can see the case for assessing the trend as an initial downtrend flipping to uptrend as the 10:00 swing high is broken. I would also be happy with how you assessed it, with a downtrend transitioning to sideways and then to uptrend. 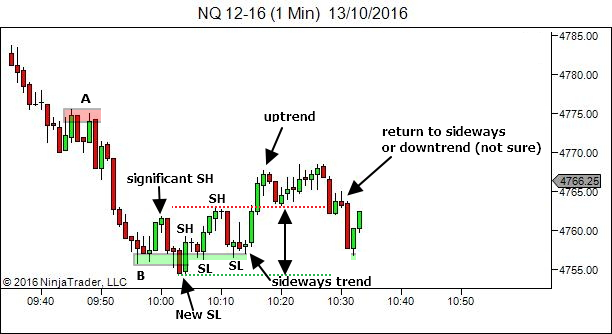 Both have resulted in a different assessment of trend, but all still provide some good setup options (although different to mine). So why do I see a sideways trend? Please review the section in the YTC Price Action Trader on applying subjectivity and overriding your “rule based” trend definition. This is (in my opinion) the most important part of assessing a trend. It has become abundantly clear since releasing the ebook series that many people struggle with the idea of subjectivity. But the fact remains that your mind is so much better at assessing trend than any set of rules. 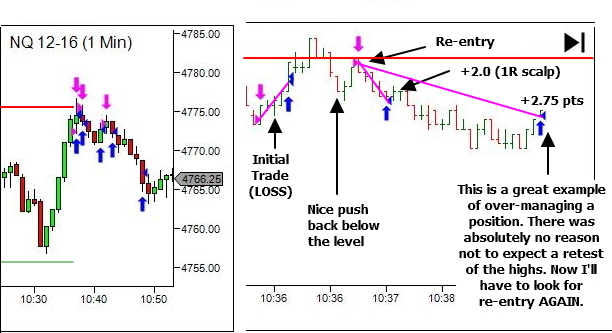 All rule-based methods will break down from time to time around the point of trend change. Step back from the chart and look. Is it uptrend, downtrend or sideways. Trust your gut instincts. So… let’s do that. Display the chart on your screen and step back a bit. Is the market in an uptrend? Or is it sideways? I do use the rules as a starting point. But I am very comfortable in overriding this whenever the picture shows something different. And this chart beautifully demonstrates one of the circumstances where I often find myself overriding the definition. Note the size of the swing AB. It is one single price swing, but quite large in size. Whenever I get a very large price swing, and price then (very shortly after) gets stuck within the high and low of that swing, I’ll often override the definition and call it a sideways trend, within the bounds of the swing high and low. This happens so often with a single long price swing. Keep an eye out for it. So yes, price at around 10:03 did break to new lows. But it was rapidly rejected. And price then got stuck within AB. By about 10:08 (or somewhere around there) I was happy to call this a sideways trend. Second question – Can we include to A resistance all congestion from 4775 to 4768? Absolutely yes. It is an area, not a line. It will include the whole area of prior congestion. I don’t tend to draw them this way as they take up too much of the chart. I prefer just a line at the outer edge of the area. But I’m always aware that resistance might be found within the area, at any point before the actual line. It’s always good to remember that everyone has losing trades and even non profitable sessions.